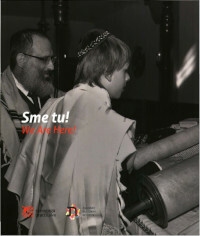 Bilingual, Slovak-English catalogue to the exhibition We Are Here! On contemporary Jewish life in Bratislava, and the changes it has undergone during the last quarter-century of freedom. Includes introduction, photos, texts by community members and an essay by Peter Salner entitled ‘The Jewish Commubnity in Bratislava (and its identity) since 1989’. This joint project of the Jewish Community Museum and the Jewish Cultural Institute was dedicated to the 25th anniversary of the fall of the communist regime.